TORONTO — Serge Beausoleil might be the head coach of the Rimouski Oceanic, but even he can feel like a student when forward Alexis Lafreniere hits the ice. "Sometimes I have to shut my mouth, I don't want to put him in a box," Beausoleil said. "I want him to be creative. He's always two steps ahead when he plays and he sees a lot of things most hockey guys cannot see, so we have to let him play." Lafreniere didn't take long to turn heads as a rookie in the Quebec Major Junior Hockey League last season and his name is already being used alongside words like "prodigy" or "generational talent" because of the impact he's having on the game. 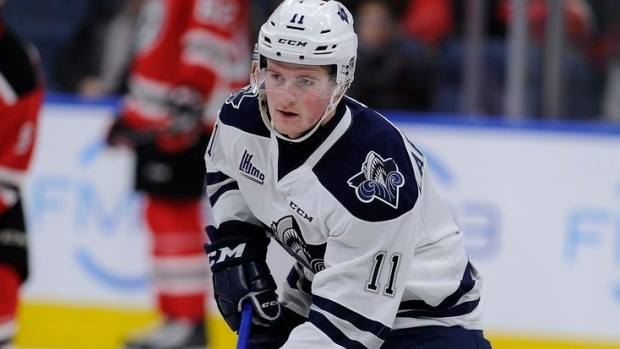 The six-foot-one, 192-pound winger has led or been near the top of the QMJHL scoring race for much of the 2018-19 season, and has 43 points in 24 games to sit third as of Wednesday. It's the type of season that would have him in NHL draft discussions, except he isn't eligible until 2020 because of a late birthday. Rimouski selected Lafreniere with the top pick at the 2017 QMJHL draft, its first No. 1 selection since Sidney Crosby in 2003. He transitioned into the league with ease, scoring six points in six games before his 16th birthday on Oct. 11. He would go on to produce 42 goals and 80 points in 60 games, earning rookie of the year while putting NHL scouts on notice. "I had no real expectations but it was a pretty good season," said the native of Saint-Eustache, Que., a suburb of Montreal. On top of dominating the QMJHL, Lafreniere has also already proven he can handle the best international players his age. He produced six points in six games with the under-17 Canada Red team at the Hockey Challenge in Nov. 2017, a tournament led in scoring by American Jack Hughes, this year's potential No. 1 pick. Lafreniere was selected to play for Canada at the U18 world championship in April, the youngest player on a squad made up of NHL first-round draft picks. He led that team with seven points in six games. This past August, he led the Hlinka-Gretzky Cup tournament with 11 points in five games for Team Canada. Making the world junior squad this December is a far-reaching goal for a 17-year-old, especially after not getting an invite to summer camp. But Lafreniere's early-season success earned him a call for Team QMJHL in the Canada Russia Series, giving him another opportunity to show world junior head coach Tim Hunter that he has the talent despite his age. "For sure (world juniors) is something of a goal if i can make it, but right now I'm focusing on Rimouski and helping the team win as much as possible," he said. Beausoleil said Lafreniere needs to work on bringing an elite performance every game so that he can be the top player on the ice every single night. "He wants to dominate," said the coach. "I think he wants to be the best. "It's a long road, we want to push him and challenge hims to gain some consistency, he's still young at 17. For us it's to push him night after night and make sure he's the best player on the ice." AROUND THE CHL: Last week the Government of Ontario excluded Ontario Hockey League players from provincial employment standards legislation in order to keep a "level playing field" with other major junior hockey leagues across the country, the province said in a release. The move maintained the status of the league's 425 players as amateur athletes, and prevented them from becoming employees regulated by the Employment Standards Act. Joshua Mandryk, a lawyer at Goldblatt Partners, which is pursuing a $180-million class-action lawsuit with Toronto-based Charney Lawyers against the league on behalf of all current and former players seeking outstanding wages, overtime pay, holiday pay and vacation pay, gave his response to the Canadian Press in an email. "We are deeply disappointed the government has decided to strip these young workers of their rights at work. The ESA is riddled with special rules and exemptions which came as a result of powerful employers like the OHL lobbying for preferential treatment. This Swiss cheese approach to employment standards is exactly what the Changing Workplaces Review and Bill 148 sought to address. "Many businesses are economically and culturally significant, but that doesn't mean they should be allowed to not pay their workers. A lot of Ontarians grab a cup of Tim Hortons on the way to the rink — should we exempt their employees from the ESA as well?" — As of Wednesday, the top 10 teams in the CHL rankings are: 1. Prince Albert Raiders (WHL, 21-1-0); 2. Ottawa 67's (OHL, 19-3-3); 3. Rouyn-Noranda Huskies (QMJHL, 19-4-0); 4. Halifax Mooseheads (QMJHL, 17-4-1); 5. Moncton Wildcats (QMJHL, 19-4-2); 6. London Knights (OHL, 15-4-2); 7. Red Deer Rebels (WHL, 15-5-1); 8. Baie-Comeau Drakkar (QMJHL, 17-6-1); 9. Everett Silvertips (WHL, 17-7-1); 10. Vancouver Giants (WHL, 14-6-2).